It seems so strange to be writing about fall fashion coming off of a huge heat wave in the midwest, but strangely it's already cooled off and if I was still in college I'd be going back to school shopping (ah, i miss those days!). Check out some of my favorite pieces of fall fashion in today's post! I love the idea of spicing up a basic sweater with a bib necklace, taking notes in an eye catching journal & rocking a pair of statement making colorful pants this fall. All of you going back to school shopping or revamping your fall wardrobe-- what are you adding? animal prints are my favorite! but I am totally lusting after that scarf, too! totally just grabbed a bunch of new sweaters today. beyond ready for fall. i'm in search of ankle boots too- let me know if you find some! Loving the ankle boots this fall as well! Just discovered your blog and I adore it! Love that sweater!! And the journal is too cute. How could you not be happy scribbling in that beauty? I love that leopard print sweater. My aim is to get a lot of cute sweaters this Autumn. 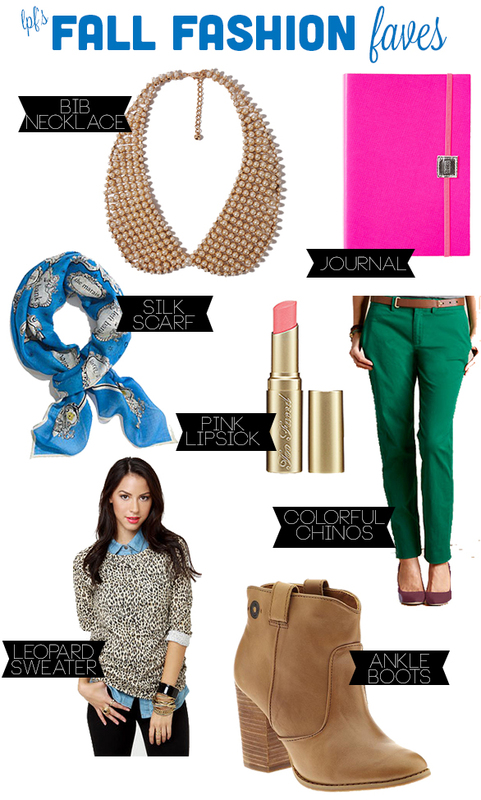 I'm with you about the colorful chinos & ankle boots! I just like the ANKLE BOOTS. i agree - i would like some more colored jeans in my wardrobe. i think i am going for more color in clothes than ever this season!?!? LPF Mag Favorite Things Giveaway! Working for the Weekend on LPF Mag! Sneak Peek of LPF Mag!